Come enjoy refreshments while seeing a photo and audio exhibit about working life in Carthage! We are looking for community members to come share stories about what it's like to be behind the scenes on their job. Bring photos of you or your family at work if you have them, too! Stop by and tell us about what you, your family, or your community do for work. We want to collect your stories so we can preserve & share them through our website, exhibits, and story slams! Join us for a night of sharing and listening to stories about working life in Hamilton County! Join us for an evening of sharing and listening to stories about working life in Carthage! Come enjoy refreshments and check out an exhibit of photos & audio stories about working life in Keene Valley! All our photos & stories are collected from members of the Keene Valley community. Join us for an evening of live storytelling! We'll have several storytellers talking about their working lives in and around Keene Valley. Come just to listen, or share a work story of your own! 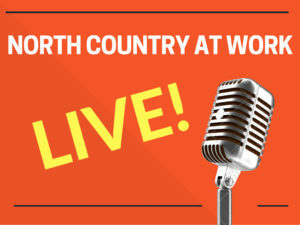 North Country at Work: LIVE!